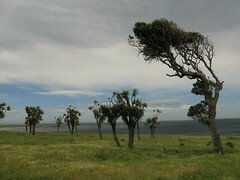 I intuitively to associate strong wind with exposed places at high altitude, but it doesn’t always work that way. Apparently Glenburn Station, up the south-east coast of the North Island from Honeycomb Rock, is one of those places that can be very exposed. I shouldn’t have been too surprised given that Castlepoint isn’t much further up the coast. This was my bail-out at my own pace walk on flat ground, as a compromise to keep me sane when my dodgy knee caused me to cancel a scurried weekend attempt at Neill Winchcombe in the Tararuas with Craig. Hopefully at a later time, though. It turns out I was the only person walking the walk to Honeycomb Rock last Sunday. A family group of about four began a few minutes before me, but turned around within the first ten minutes. I don’t blame them, but having driven for a couple of hours to get there, I wasn’t about to do the same. I’d heard that Honeycomb Rock would be an interesting place to visit, but didn’t really know what to expect. Information about the walk is fairly scarce, and this was combined with my general lack of research before I left. Being ill informed as I was, I ran into a few issues. The first was that aside form the starting point (Glenburn Station), I didn’t really know where to start. 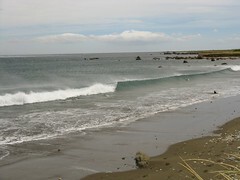 The second was that aside from somewhere around the coast, I didn’t really know where to go. The third was that aside from something about fancy rocks and a seal colony, I didn’t really know what to expect. I didn’t help that I’d for some reason been thinking it was “Honeycomb Rocks” instead of “Honeycomb Rock”, but I guess now I know better. 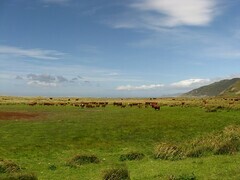 Location: Glenburn Station, Wairarapa Coast. Route: Walk to Honeycomb Rock and back, wherever that is. 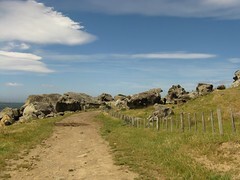 The walk is administered by the New Zealand Department of Conservation in the Wairarapa region, but is entirely on the privately owned Glenburn Station (sheep and cattle farming). It’s officially closed when Glenburn Station is in baby-raising mode (ie. lambing season), but even the DOC signs only say that this is “usually” about September and October (despite the website info being specific about this), so if it’s near this time and you have any doubt you should probably contact an office in the Wairarapa to find out before going all the way out there. It’s not a major enough walk for much information to be available through DOC’s passive resources beyond a sparsely clad pamphlet downloadable from the website, and as a coastal walk it’s probably targeted mostly at people who live in relatively nearby places such as Carterton or Masterton. It’s not often that I go out for a daywalk and spend two thirds of the time driving, but I wanted to see what it was. 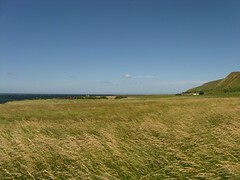 Driving over the hill and down to the coast, it was already clear just how windy it was simply by looking down on the fields and seeing the giant waves of wind racing over the grass-lands below. 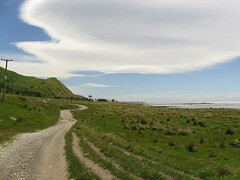 The unsealed road passes through a couple of farm gates, so if you’re going this way it may be necessary to open the odd gate — the standard New Zealand farm code applies of course, which is to leave the gate as you found it. (ie. Close it if it was closed, and leave it open if it was open.) Some time after 10am on Sunday morning, I parked the car in an intimidatingly strong wind beside the end of the road, and ducked outside finding some ad-hoc shelter under the car to sort out my gaiters. Gaiters probably aren’t needed here as a rule, but I’ve often found them to be very useful around farm-land even when it wasn’t clear they would be. Good footwear is a must, but that’s probably the case anywhere with a significant walk. distance, so I just hopped down. I watched the family group (mum, dad and a couple of children) leave a couple of minutes ahead of me, clutching coats around their ears to keep the wind off, and followed the along the fence-line for a few minutes, which is marked over the farm by occasional DOC orange triangles. DOC goes to great pains to stress to people that the beach cannot be legally reached from the track, probably because people would otherwise wander over farm-land where they shouldn’t be. The marked track does actually follow directly alongside the beach in places, however, and one such place is within a few minutes of the start, where it heads direct to the beach and routes people outside the farm fences for a while, practically on the beach, before hopping back over the fence to be slightly further in-land. It was during this short stretch on the beach that I overtook the earlier-mentioned family group, and I don’t think they went much further than this because the wind in the air was just so frustratingly and consistently strong. the coast and the hills. Although the rule is to stick to the DOC-marked track and never leave it, I did find the entire thing fairly ambiguous. Having followed the markers over a fenced field from the coast and over a fence, I just lost the markers and didn’t pick them up for ages. At this time I decided to follow the coastal farm road on the assumption that it was probably where I was supposed to be, and my lack of research prior to arriving wasn’t helping. After 10 minutes of this, I started to wonder if I’d missed a critical marker completely, and if I’d been supposed to head up a small spur onto the top of the hills above the coast. During this time I met the only other person I’d see for the entire walk, driving a farm vehicle the other way back towards the public road. He grinned at me as he sped past and I took this as a sign that I wasn’t in a horribly illegal place, but it didn’t help on reaching a farm gate further up the road that was ambiguously un-marked by anything of a DOC nature. I eventually discovered on the way back that there is a sort of a track, even with occasional markers, that sometimes seems to run parallel with the farm road on the coastal side, at least as best as I can tell. If you find yourself around here and can’t find the nice, legal DOC track, I’d suggest just sticking to the road unless you notice otherwise. Chances are you’re within a few metres of the legal track anyway, and the primary purpose of this restriction is to ensure that people don’t interfere with work or conditions on the farm in unexpected ways, antagonise animals accidentally, fall into holes and sue the Glenburn Station owners, or whatever else might occur as a consequence of people being in unexpected places. Being on the road, at least, is probably the next best way to minimise potential problems if the DOC-marked track isn’t visible. I did venture from the road at least once, which was necessary to find a rock behind which I could hide from the wind while I applied some sunblock. I also replaced my sun-hat with a beanie to protect my ears from the wind blasting, and this was one of the few times that I’ve felt I had to periodically check to see if my beanie hadn’t blown off my head. Several times it came close. DOC track buried somewhere to the right. There were three gates in total, and it was only shortly before the third gate that I began to notice the occasional pole poking low out of the ground with small broken fragments of orange plastic nailed to them. The second gate, still not clearly marked by anything DOC related, holds a sign saying “Coast”, and it’s after this that the road moves quite close to the coast. As opposed to running about 50-60 metres inland, it’s now a hop, skip and jump of less than about 2-3 metres away. Although DOC states loudly that there’s no legal access to the beach from the DOC track, the road at least gets very close here. As it turns out, parts of the DOC track obviously do reach the coast regardless, because there’s a marker I’d missed in the vicinity of the major seal colony about half way towards Honeycomb Rock, and the seal colony is (of course) on the coast. Generally though, they don’t want people randomly wandering over the farm-land, with good intentions or not, for good reason. 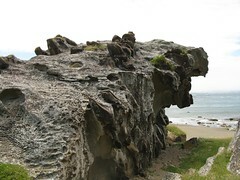 First signs of unusually-eroded rocks. The third gate, just before Honeycomb Rock, actually does have a small orange triangle marker attached to confirm that it’s still a DOC-managed route. As soon as I opened this I could suddenly smell the stench of the New Zealand Fur Seal, but it I didn’t see the straight away. The rock itself stands out clearly on the coast, and I took a couple of photos. Not have a clue what to expect, or if I’d reached it, however, I thought that perhaps I was supposed to be reaching a much larger cluster of rocks rather than a single rock, so I kept walking for a while. The third gate, which actually has a marker. The wind had been blustery and strong all the way, but on turning the corner at the gate it suddenly became much extreme. Occasionally it would be carm, but the stirring of the trees in the distance would always turn into approaching waves of dancing grass, and spray from the waves being thrown in what was surely the wrong direction. There would be about enough time to quickly examine yet another creative variety of four letter words scrolling through my mind before having to rapidly duck to the ground thinking “oh krud, not again”, before it would hit. These cows that I mention were the crowd of cattle cautiously eyeing me up, and being careful to stay together in the herd, as cows do, whilst I carefully negotiated my way around them. Soon after this was a shallow and un-bridged stream running into the sea, which I walked through, and a short distance later was another gate that looked even less as if it was designed for casual walkers to pass through. At this time, with the wind battering me, I decided that i really didn’t mind if I’d reached whatever it was I was supposed to be looking at, and I’d turn around now. Having slowly come to the conclusion that perhaps I’d already passed all of the honeycomb, I stopped on the way back for a more proper look at what I later confirmed actually was Honeycomb Rock. A number of grumbling seals were basking near it so I didn’t manage to get too close to the sea (not wanting to disturb them or cause them to feel uneasy by getting between them and the sea), but it’s quite an interesting formation I guess. Not the kind of rock you see every day, unless you live in a place like Glenburn Station I suppose. What I should have done was to look on the southern end of the rock, where there’s supposed to be the wreck of the Tuvalu, “a Fijian trader which ran aground here on its maiden voyage on 11 January 1967”. Seal guardians at the rock. 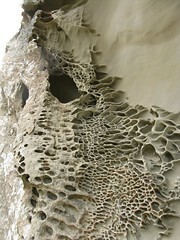 I’ve been trying to find out the geological details of Honeycomb Rock, about how it formed and why it’s like it is and such. 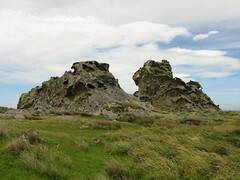 A quick and lazy search on the web specifically about Honeycomb Rock doesn’t reveal much more than several plagiarised verbatim-lifted-and-uncredited copies of the DOC description that states it’s “a spectacular outcrop on the Wairarapa coast, so named because of the remarkable cell-like weathering pattern which gives the rock a honeycomb appearance.” So far the best reference I’ve found about the general concept is the Wikipedia article about Honeycomb Weathering, which essentially says it’s a reasonably common process on porous rock on horizontal planes in coastal areas. The salt-water settles within the pore spaces in the rock (rather than simply running off), and the salt from the water then crystalises as the water around it evaporates. Because it’s inside the pores, it the crystals eventually start to break seals open as they grow within the rock, and this opens up the rock to other kinds of erosion in a certain way that result in the honeycomb appearance. If I understand it correctly, anyway, but please correct me if you know otherwise. Pretty cool, actually. to the beach on the way back. Now on my way back, I thought I might try to walk on the DOC track that I could see poled one metre to the right of the road, although I stopped from time to time to sit on the beach and have staring contests with seals before the track and road left them behind. It was basically an animal track more than anything else, and when the DOC markers disappeared again (as far as I could tell), it just became several fairly non-distinguished animal tracks roughly between the road and the coast, occasionally converging back to where the road was at places such as gates. As I reached the mini-peninsula point that juts out about half way back, I spotted another DOC pole poking out of the ground with a marker on it, and took this as a happy sign that I could legally cross the farm-land, if for no other reason than to get back onto wherever the DOC track was supposed to be, since apparently it wasn’t where I was right at that time. 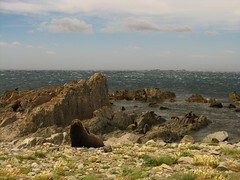 The point of this marker was to provide access to the main fur seal colony, and at this time of year there were quite a few hanging out. I didn’t count, but certainly at least 50, and perhaps triple that if counting the others spread up and down the coast to Honeycomb Rock. I spent a few minutes having another staring contest with a big grunty seal sitting on a rock. Then I turned around and walked back to the road. sea as the waves come in. Nearing where I’d parked the car, I finally managed to replace my sun-hat, and the cord that ties it down proved its practicality on several occasions when my hat blew away. The sea was still rolling in with as I approached outside the edge of the farm-land, the wind wisping away any spray well back into the sea, and I stopped for a few photos before reaching the car. With a roughly 2.5 hour drive each way from Wellington and much of that on unsealed roads (and stopping for things like a very late lunch), I worked out that I was walking from 10.20am to 2.07pm, so a little less than 4 hours of walking — it may be wildly different for different people depending on how much of a hurry any given person or group is in, and the length of time of the staring contests with the local wildlife. It’s roughly similar to the DOC posted time to the “Track End” on the sign at the beginning, whatever that means. The same sign states it’s 3 hours return to Honeycomb Rock, and the online DOC information estimates a far more conservative time of 5 to 6 hours. So I’m still not really sure which rock is which, or how far I was supposed to go — perhaps the three hour “Honeycomb Rock” was the one I saw part way along that was practically on the beach, and the other big one that I thought was Honeycomb Rock was the 4 hour end of the track. Ultimately it doesn’t matter because it was an interesting walk, but I find it frustrating not knowing these details lest I might have missed something interesting. It’s a photogenic walk on a day like today, especially without too many people around and if you can prepare things to tolerate the wind if it’s present. I was relieved to be able to sit in the car and recover from the wind for a few minutes, but looking back on the photos I took along the way, I feel quite good about where I went. 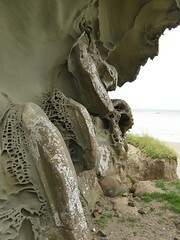 This entry was posted in daywalk and tagged coastal, daywalk, department of conservation, independent trip, wairarapa. Bookmark the permalink. The family of 4 struggled on for a couple of hours, having lunch sheltered by the boxthorne. It was when the kids needed to be tied down to stop them from going airbourne that we turned back. However walked the track again last weekend. We were the family group you were talking about. It was a horrendously windy day and we did turn back but we did make it to the first Point where we sheltered behind some boxthorn for some lunch. We returned last Saturday when things were a bit calmer and finished the walk (we had done it once before 3 years ago). We find that the best way is to follow the road after you have passed the farm settlement and then go down to the beach and follow the markers for the second half of the walk. 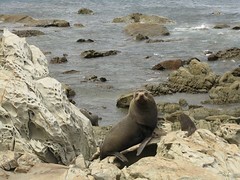 It is a great walk on a fine day with great honeycomb rocks and seals at the end and even an old shipwreck! Hey thanks for the tips. On the way back I noticed a marker poking from the ground on the far side of the farm (near to that memorial stone) which I guess marked the intended walking route even though it didn’t seem marked between there and the mid-way point, but I’m sure the road’s also fine. And yes I guess airbourne children would be a problem. It was hard enough standing upright for much of the time as far as I was concerned. Glad to hear you got back again more successfully. 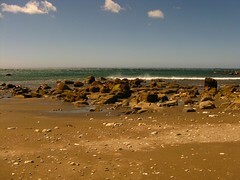 Would like to put some of your images up on TourismStuff in the “Images of the Region” category, in respective regions. It’s a non-commercial category. To such I can add a website or email address. Could even give you ability to upload with Username/Password ! Hi John. Yes, certainly, although it’d be good if you could please credit them to me and mention the copyright, and linking back to here would be great.